How do Roles and Permissions relate? Roles in Echo represent a predetermined set of permissions. All roles are automatically inherited by subdomains. Domain Roles - Define the permissions that a user has in the domain. (Roles are assigned to Staff and Echo Admin only). Course Roles - You are required to assign users a role when enrolling them in a course, giving them that role's permissions within the scope of that enrollment. 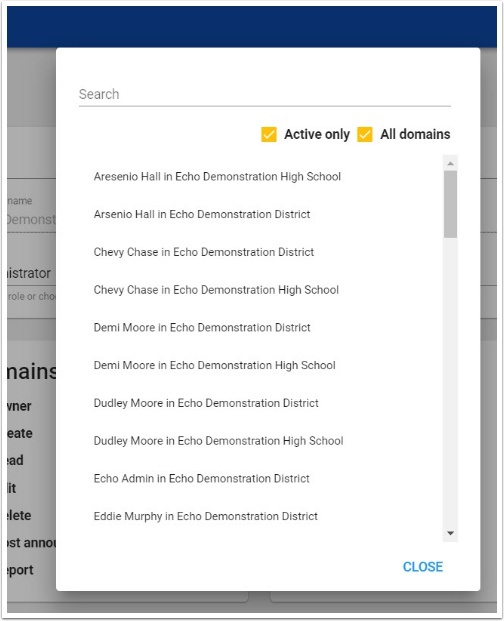 Echo Administrator: This is a domain role that gives a user all available permissions within all levels (Domains, Users, Courses, Enrollments, and Objectives). Owner: This is a course role that gives a user complete control over the course. Course-level permissions include: Read, Owner, Read Full, Edit, Delete, View Gradebook, Setup Gradebook, Grade Assessments, Grade Assignments, Grade Discussions, and Submit Final Grades. Teacher-Owner: This is a course role with the same permissions as the Owner, except they cannot delete the course or enroll users. 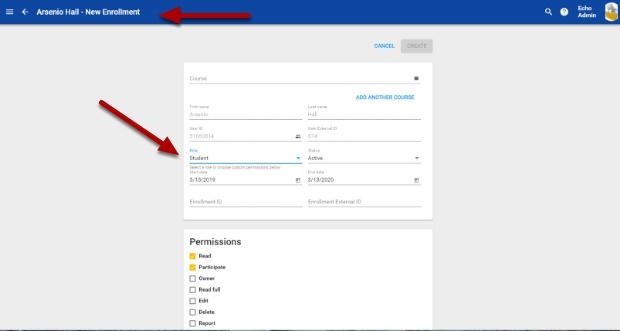 Course-level permissions include: Read, Read Full, Edit, View Gradebook, Setup Gradebook, Grade Assessments, Grade Assignments, Grade Discussions, and Submit Final Grades. Staff: This is a course role allowing the user to administer the course. Read, Read Full, Edit, View Gradebook, Setup Gradebook Grade Assessments, Grade assignments, Grade Discussions, submit Final Grades, Enrollments, grade reports. When you grant them from the Permissions screen in the Domain tool, they are attached to the user and apply throughout the domain, regardless of the user's specific enrollments. When you grant them from the Enrollments screens of either the Users or Courses tool, they apply only to that enrollment in the specified course. Open the Course Tool and Click on the Course ID. Either select the user for editing the course role or create a new enrollment and assign. Select the appropriate Role for the course; in most cases it will be Teacher Owner or Student. Owner Domain Grant, revoke, modify domain permissions for a user. Create Domain Create domains and subdomains. Access the Admin app (this is the only permission that grants this access). Access (read) domain and subdomain information including subscriptions, roles, and settings. Delete domains and subdomains (including the domain they exist in). Post announcements to the domain. Run reports using domain data. Domain Assign rights and subscriptions to domain users. Create domain users, but cannot manage permissions. Access the domain user information. Make changes to domain user information (first name, last name) and change password. Cannot edit permissions or username. Sign in and make changes as another domain user. Run reports using domain user data. Read Course and Domain Access (read) specified courses in the domain. Complete activities in specified courses; this permission is only available for student users. Yes: Read Course is granted for Course roles. Grant rights to specified courses. Yes: Read Course and Read Full Course are granted for Course roles. Create courses in the domain. Access (read) all course content data in the domain, including assessment questions and hidden-from-student content, regardless of their other enrollment rights in the course. Make changes to specified courses. Run reports using specified course data. Setup specified course Gradebooks and make changes to their settings (grading schemes, grade scales, item weight, etc.) in Activity Data and Course Data. Grade assessments in specified courses. Yes: Read Course, Read Full Course, and View Gradebook are granted for Course roles. Grade assignments in specified courses. Submit final grades for specified courses and their grading periods. Read Domain Access data, including grades, that is associated with the specified enrollments. Read Domain Access objectives and objective maps from specified objective sets. Edit Domain Make changes (add, update, or delete) to objectives and objective maps from specified objective sets. What are the recommended settings for a 'Teacher' role? We are finalizing our role permissions and would love any feedback. Your best bet is to use the default roles that we have set up for you! I would like to add the teacher role to my already existing administrator role. When I follow the steps above, it seems as if I do this the administrator role will disappear. So, how would I add the teacher role and still maintain the role I already have?